Metropolis Church, Mystras. Early 14th century inscription on the southwest column, including episcopal acts by Nicephorus Moschopoulos and the curse-clause against his enemy. These are the final four lines of the text that you can see inscribed into the the column in the image above (on mobile) or to the left. As a matter of fact, the text on the column is much longer than that: it also records the five episcopal acts of the archbishop Nicephorus, revealing his special interest in securing the privileges and the landed property of his pious establishment. Of course, that’s a lot of information to get in an opening paragraph, and you may be wondering what it is all about. Let’s start from the beginning. 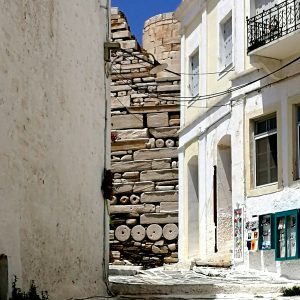 In this post, I want to continue the stories of ancient spolia (reused materials of old structures incorporated in later buildings) introduced on this blog by my colleague Heinrich Hall. In his most recent text concerned with spolia, we were told how the Athenians of the mid-5th century BC put together old column drums to create the most original war memorial of antiquity. Today’s story is quite different and yet it, too, is about ancient columns being reused and reshaped in order to commemorate the past and to convey a new message at a different time. The upper parts of Mystras viewed from the Lower Town, with the Despot’s Palace to the right and the hilltop castle on the left. The plot finds us in the medieval fortified settlement of Mystras. Set in an extraordinarily beautiful location in the southern Peloponnese, Mystras is a UNESCO-listed World Heritage site at the foot of Mount Taygetos, a place where visitors can frolic on centuries-old paved pathways while wandering amongst the remains of famous palaces, luxurious monasteries and patrician mansions. In the old and glorious days of the 14th and 15th centuries, this was one of the most important intellectual and cultural centres of the Byzantine Empire, a great meeting point between the Eastern Orthodox and the Western (Catholic) world. Mystras castle viewed from below. 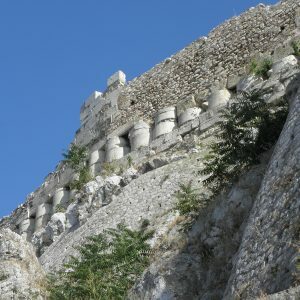 The original core of Mystras, the summit castle, was founded in 1249 by the Frankish (meaning Western/Latin/Catholic) ruler of the Peloponnese, William II of Villehardouin, in order to reinforce, at least temporarily, his Latin dominion in the region after the Fourth Crusade. In the meantime, on the other side of the Aegean Sea, the Byzantines had already experienced the most dramatic events in their history (up to that point) by losing their capital and part of their territories during the years following 1204. Unfortunately for the Franks, their presence in the southern parts of the Peloponnese was relatively short-lived. About a decade after the construction of the castle, Mystras was ceded to the Byzantine emperor as ransom for the release of William II, who had been captured in a battle shortly before the final Byzantine reconquest of Constantinople in 1261. The 14th-15th century palatial complex of Mystras and administration offices overlooking the main square of the Upper Town (after the recent restoration project). Our story, thus, begins at the moment when a small but strategically positioned Frankish fortress was re-destined to become an immensely large and important Byzantine castle-town, occupied primarily by former residents of nearby Lakedaimon, better known as ancient Sparta. The first Byzantine governors of Mystras settled on a natural terrace below the castle, an area covering approximately 6 hectares, which formed the Upper Town and the centre of administration. The Lower Town, however, was much more densely inhabited and provided enough space to accommodate the high aristocracy and a number of affluent and lavish clerical establishments. The most significant of them was certainly the Metropolitan See of Lakedaimon, the seat of the region’s most powerful bishop, which was transferred to the new settlement after 1262. The city’s new Metropolis or Cathedral, dedicated to St. Demetrius, was by necessity a building of some elaboration and also the product of a known clerical patronage. Probably erected between 1263 and 1272, during the time of the first archbishop to reside at Mystras, Eugenios, it was originally a large and luxurious, triple-aisled and timber-roofed basilica. This choice of shape, following a very established and ancient architectural type, deliberately emulated the plan of the previous metropolitan church, just a few miles down the hill in Sparta/Lakedaimon. In honour of his efforts, Eugenios himself was depicted in a fresco in the southern apse of the sanctuary. A closer look at the eastern façade of the Metropolis. Materials for the church’s construction were likely transported from Lakedaimon, just three miles (5 km) away. These old blocks, either from the ancient ruins of the earlier city or from more recently abandoned structures, were incorporated as spolia into the walls and the transitional points of the original 13th century brick-and-stone masonry. They are best seen in the eastern façade of the building: here, two large discs of opus sectile, taken from an earlier church floor, have been positioned above the side apses. 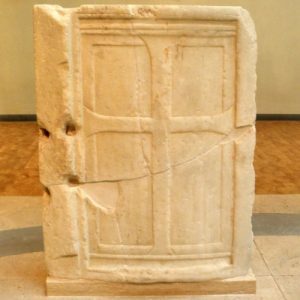 A reused Byzantine altar-screen carved from white marble can still be seen as it was inserted into the left jamb of the upper central window. Moreover, that piece and its equivalent on the right have been re-cut in the middle to receive glazed bowls (now missing), so that they were turned, beyond their new use as spolia in themselves, into beautiful decorative frames for these colourful ceramics. Thus, the incorporation of ancient materials was an important and – paradoxically – innovative component in the initial phase of the construction, used in order to enliven the exterior walls. Undoubtedly, the old spolia would have looked much more lavish and valuable than contemporary brick and mortar and the Metropolis itself would have been transformed into a “trophy monument” for the locals, evocative of their past and of their position in the continuation of the ecclesiastical authority of the See of Lakedaimon. What can be seen in the interior is even more noteworthy. At first glance, the space looks like a typical triple-aisled basilica. At a closer look, six ancient unfluted marble columns (four of them are visible in our image) were placed in the inner space to divide the nave from the side aisles (and to support the superstructure of the nave). All of them date to Late Antiquity and were almost certainly brought here from nearby ancient Sparta. They were also accompanied by bases and column capitals of the same period. Like the spolia used in the exterior surfaces, the columns were selected as prized old materials to enhance the new sacred interior space of the church, and to declare continuity with the Byzantine past. The famous octagon in Charlemagne’s Palatine Chapel at Aachen, notable for its copious use of Roman spolia, some brought across the Alps at great expense, other simulated. The use of ancient columns in medieval architecture is well-known and attested both in Eastern and Western Europe. For instance, in Charlemagne’s celebrated Palatine Chapel at Aachen, built in AD 790, the medieval reuse of ancient spolia transformed them into symbols of the acceptance of the authority of the Roman past and its transfer to a new political entity. In that early medieval “Carolingian” church, the Corinthian columns of the upper galleries are actually Carolingian simulations of spolia and not authentic Roman materials. However, they were proclaimed “original spolia” by Charlemagne’s key advisor to express his master’s claim to imperial status: “… he [Charlemagne] was unable to find marble columns for his construction anywhere else, and so he had them brought from Rome and Ravenna”. Official chrysobull (imperial document) on parchment, recording the Emperor Andronikos II granting privileges to the Archbishop of the nearby settlement of Monemvasia (late 13th-early 14th century). The document bears the emperor’s gold seal and signature. In the heading miniature Andronikos II is depicted with his imperial insignia, standing to the right of Christ (to the left from the viewer’s perspective). Athens, Byzantine and Christian Museum. It was some forty years after the foundation of the church by the archbishop Eugenios and his successors that the columns acquired an extra function: providing smooth surfaces suitable for inscriptions, they turned into a perfect and ever-lasting archive of information and political propaganda. To be more specific, by 1291 the Metropolis had acquired a new archbishop, Nicephorus Moschopoulos, a very important man who promoted himself as the church’s founder. Nicephorus was an educated theologian and calligrapher, nephew of the famous Byzantine poet Manuel Moschopoulos, with close connections to the early 14th century intelligentsia of Constantinople. His career began on the island of Crete as archbishop under the Venetian authorities, but between 1288 and 1291, he was elevated by the Byzantine Emperor Andronikos II and the Patriarch to the position of the President and Archbishop of Lakedaimon. At the time when he arrived at Mystras, the Metropolis had already been constructed and decorated with frescoes by his predecessors. Unlike Nicephorus, the previous archbishops had fully endorsed the policies of Michael VIII Palaiologos, Andronikos II’s father; namely they supported the new emperor who had reconquered Constantinople and Mystras from the Crusaders and who had endeavoured to reunite the Eastern Orthodox Church with the West. Despite all the efforts made by both sides, the Union of the Churches appeared increasingly unachievable and unpopular; and soon after the emperor’s death, his heir Andronikos II and his followers adopted a new policy, now opposing reconciliation. Nicephorus was most certainly one of these followers! Thus, the inscriptions raise an interesting historical question, namely whether Nicephorus is indeed the primary founder of the Metropolis (as the inscriptions explicitly state) or whether this is a convenient lie! A detail of the column inscription by Nicephorus. It is clear that Nicephorus found the Metropolis already constructed when he took office, but it is also clear that he (together with his brother) was responsible for many alterations to the primary plan, certainly for the addition of a two-storey western hall (narthex). He also completed the painted decoration of the church and he added a library and a scriptorium for copying manuscripts nearby. Additionally, he started the practice of carving in stone records of his achievements, the new holdings and the improvements made during his tenure. Nicephorus thus decided to promote himself as the main founder of the Metropolis and as the only representative of the Emperor’s (Andronikos II’s) new ecclesiastical policy. In a very critical period for the empire, when the aristocrats and intellectuals of Byzantium were divided fanatically into supporters of the Union of the Churches on the one hand and those rejecting the idea on the other, Nicephorus reshaped and rewrote the contemporary history of his day. With a zero-tolerance strategy towards followers of the unionist policy in general and especially against his predecessors, he condemned and fully eradicated their memory and deeds from the walls and surfaces of his “own new Metropolis”. The figure of an archbishop depicted kneeling at the right of the Virgin Mary at the central apse of the sanctuary was intentionally scraped off in an act of damnatio memoriae. The arrow indicates where it was. In the same context, the figure of an archbishop, represented kneeling in prayer at the feet of the Virgin Mary, in the conch of the sanctuary apse (a visually dominant location) was intentionally scraped off by Nicephorus in an act of damnatio memoriae, i.e. of condemnation (or eradication) of memory. The same happened to an early dedicatory inscription that had been engraved in the second column on the south side of the nave. Let us now return to the first phrase of this post, because now we can place it in context. The curse-clause inscribed on the southwest column of the church, next to Nicephorus’s dedicatory inscription and notarial acts, is part of the same behaviour against his despised predecessors. 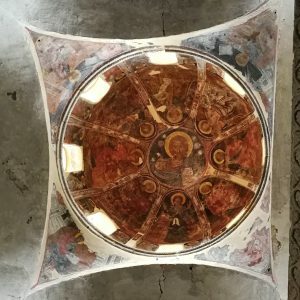 Another story, maybe for another post: the dome of the Metropolis at Mystras. Finally, like all the maledictions found in Byzantine documents, the Metropolis inscription contains the very important invocation of the curses of the 318 Holy and “God-bearing” Fathers who took part in the First Ecumenical Council of Nicaea in 325, namely the Fathers who defined the Christian doctrine for the whole of Christendom. In other words, Nicephorus cursed for good in life and death all his political/religious adversaries and whoever would be a threat to his institution and its financial growth. The curse-text was beautifully inscribed at eye-level, facing the central nave of this most pious establishment, making clear his new public message to all members of the congregation: locals, clerics, high officers and the royalty of his time and beyond. In appropriating the ancient columns and the entire church, Nicephorus Moschopoulos created a new space of performance and communication, a place to write and disseminate a new history and to frame himself as the only righteous authority within the sanctity of the Christian present and past. There is a lot more to say about the history of Mystras and of its churches, and for sure, much more about the role of ancient spolia in the medieval architecture of the Peloponnese and beyond. In the Peloponnese, there are also more stories to share about the use and reuse of places and monuments throughout time, and about the messages and narratives attached to them. To hear them, join us on Exploring the Peloponnese!